CARTS passengers can Hop on board using their smart phones to purchase passes! The Capital Area Rural Transportation System, THE BUS in San Marcos and Go Geo riders in the City of Georgetown can now use their smart device to purchase bus passes. Hopthru is a San Francisco based mobile ticketing platform for public transit agencies. Using the Hopthru app, riders are able to purchase passes anytime, anywhere and then present them while boarding. Riders may purchase passes with their credit card, debit card or commuter benefits card and then store them until they are ready to ride. Hopthru enables riders to purchase passes at their convenience rather than stand in line at stations or on the bus to pay for physical passes. Riders can receive a link to download the app by texting “hopthru” to 43506. After signing up, they are prompted to select their transit agency, rider type and ticket type, then complete their purchase. Once a rider is ready to board, they can activate their pass and then present it to the operator while boarding. Purchased passes can be activated at anytime with or without internet connection, enabling riders to travel without having to worry about keeping a cell signal. CARTS provides transportation for the non-urbanized areas of Bastrop, Blanco, Burnet, Caldwell, Fayette, Hays, Lee, Travis and Williamson counties and the San Marcos urbanized area. 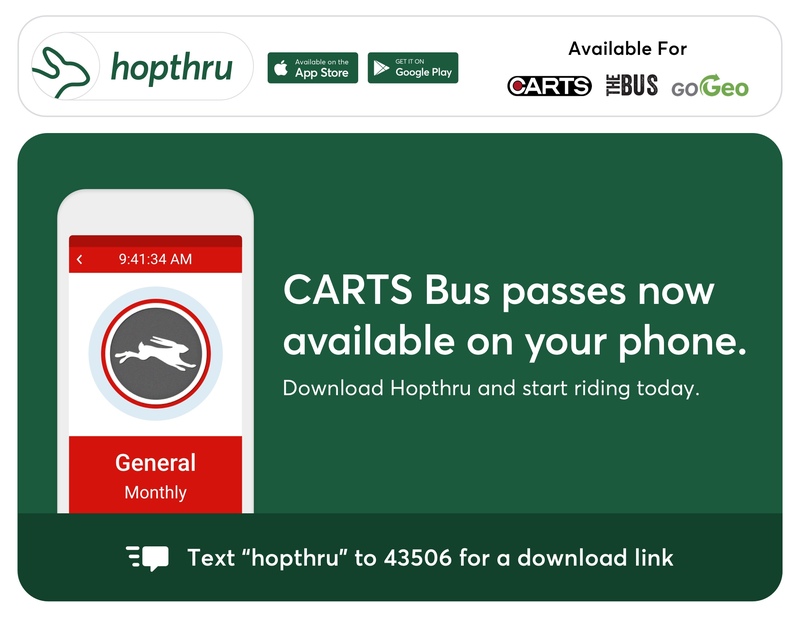 Anyone in the CARTS District will be able to ride one of the many CARTS services using the new Hop Thru app effective September 17, 2018 and the first ride is FREE! Go Geo passengers in the City of Georgetown and THE BUS passengers in San Marcos will also be able to download the app for transit services there.